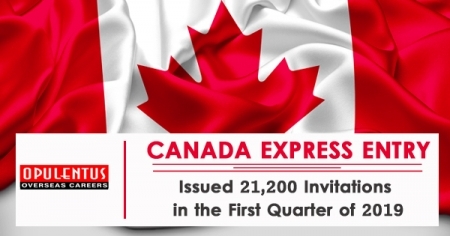 The Immigration, Refugees and Citizenship Canada (I.R.C.C) announced a sum of 21,200 Invitations to Appeal for PR in Canada in the opening quarter of the year 2019. It is 3,700 higher than the entire number of invitations declared during the corresponding period in the year 2018. The year 2019 started with the biggest ever opening draw of Express Entry. A sum of 3900 invitations was announced in the opening draw conducted on Jan 10. In the preceding year, the entire number of ITAs announced in the opening draw of the year was 2750, while in the year 2017, the Invitations number was 2902. This year, 4 out of 6 draws conducted so far had a size of draw 3350, while two remaining draws had a capacity of 3900. The opening quarter of 2019 also observed the least CRS score demand declining to as low as 438. It is the lowest CRS score demand for a draw of all-program since the requirement of CRS was 436 in the last quarter of 2017. The opening quarter of 2019 was also an active period for provincial nominee program as the provinces of Canada chose a good number of Express Entry applicants by dedicated streams. As per the 03-year Canadian immigration levels plan for 2019-2021, the consolidated immigration goal of P.N.Ps for the year 2019 is 61,000. By the year 2021, this will rise to 71300 admissions. Human Capital Priorities Stream of Ontario conducted its most significant draw ever in the opening quarter of 2019. A sum of 1,493 Notifications of Interest was announced to Express Entry applicants who had CRS scores within 439 and 448. Nova Scotia Nominee Program (N.S.N.P) conducted two draws in the opening quarter of 2019 for applicants of Express Entry through its Nova Scotia Stream of Labour Market Priorities. In the initial draw conducted in Jan, accountants and financial auditors with CRS scores within 400 and 450 were aimed while the next draw conducted on March 20 aimed Express Entry applicants who had listed French as their primary official language. Other Canadian provinces including Manitoba, Saskatchewan, and Prince Edward Island also conducted draws to choose applicants of Express Entry. The Immigrant Nominee Program of Saskatchewan (S.I.N.P) conducted 03 Express Entry draws in which a sum of 515 invitations was announced to Express Entry applicants enrolled in the province’s special Expression of Interest pool.